There are many things that cisgender adults have the luxury of taking for granted that transgender persons cannot afford to do. One of those is using the restroom. For many transgender individuals, something as routine as going pee means a choice between two uncomfortable--even dangerous--alternatives. “Many trans folk face the choice of being yelled at in one bathroom or physically assaulted in the other, so there is a lot of fear,” says Teagan Widmer, the founder of Refuge Restrooms, an application for transgender individuals. Teagan is a graduate of Pacific Union College, the daughter of an Adventist pastor, and a trans woman. Just over a week ago, Teagan launched an iOS application designed to take some of the anxiety out of taking a trip to the restroom. 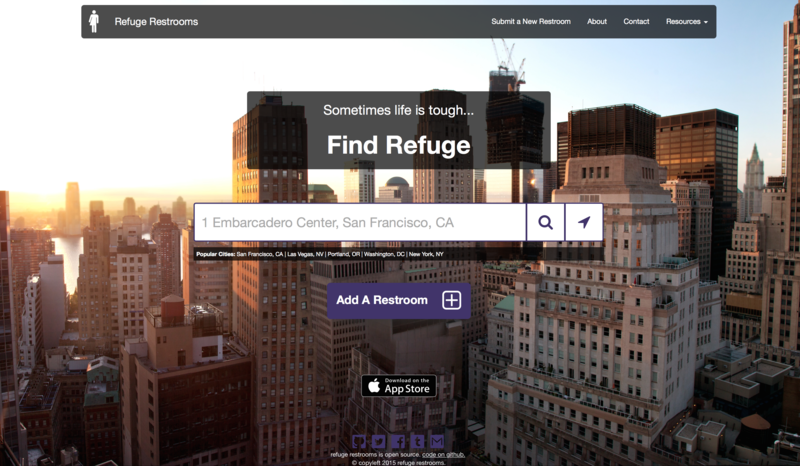 The Refuge Restrooms app, based on a website she created in February 2014, provides an overlay on Google Maps of restrooms deemed safe for transgender, intersex, and gender nonconforming individuals--segments of society that face widespread discrimination and alarmingly high suicide rates. When she graduated from PUC’s English Department in 2010, coding and app-making was not on Teagan’s radar. She wanted to teach Theatre Arts at an Adventist college, but that goal never panned out. Teagan transitioned in 2012, and says she knew at that point that she would probably never work in Adventism (though she is still open to the idea, she says). So she refocused on programming. Teagan taught herself Ruby, a computer programming language, and that opened new doors. “Refuge happened because I needed a project to teach myself how to program,” she says. The project grew out of a similar application that went defunct. Teagan hopes the Refuge app will provide a safe haven for trans people on the internet. She has plans to expand the website to encompass emergency housing for trans individuals. The iOS app is easy to use, but reveals a glaring need. After downloading the app on my iPhone, I immediately began looking for safe restrooms in my area. I found a small handful in Riverside, California, but none at all marked in nearby Loma Linda. That doesn’t mean there aren’t any safe restrooms in that town, but none have been designated. The app relies on users to help identify and designate safe restrooms. The app is worldwide, and its database is especially robust in larger U.S. cities--San Francisco, Las Vegas, Portland, OR, Washington, DC, and New York City. The Android project’s github repository is at https://github.com/RefugeRestrooms/refugerestrooms-android. Until the Android app drops, the safe restrooms database is always accessible on the web: http://www.refugerestrooms.org.